Green life ski & spa resort Bansko (ex. Paradiso Verde Ski & Golf Residence) vacation hotel in Bansko mountain and ski resort in Bulgaria. - 10 % discount until 30 Nov 2017. 5=4, 7=6 & 14=12 during 07 Jan - 01 April 2018! Location: Green life ski & spa resort Bansko is the new name of the former Paradiso Verde Ski and Golf Residence. This is a luxury holiday complex is located in the picturesque area of Gramadeto, at the foot of the northern slopes of Pirin Mountain and a few hundred metres from the centre of Bansko. The distance to the first ski-lift station is about 700 m. Green Life Ski & SPA Resort is a stylish mountain aparthotel nestled in evergreen forest in a scenic area where fabulous views of the old center of Bansko and the Rila, Pirin and Rodopi mountains reveal. In combination with interesting services and SPA center the complex ensures complete harmony of peace, relaxation and good service for your ski vacation, SPA holiday or an unforgettable summer adventure. The complex is located on the border with Pirin National Park - one of UNESCO sites in Bulgaria. Green life ski & spa resort offers a lush garden with a total area of 5,000 m2, featuring an open-air swimming pool, solar terraces, beautifully arranged green areas with rare mountainous plants typical of Pirin Nature Reserve, as well as a specially designed artificial river running across the whole area. 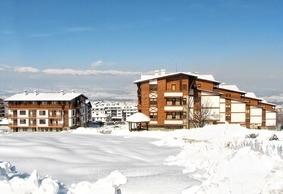 Accommodation: Green life ski & spa resort offers different variations of the basic types of apartments: studios, one- and two-bedroom apartments. Most apartments have balconies with incomparable views over the Rhodoppe Mountains and Bansko or Rila and Pirin Mountains. Each apartment is designed with a ski-wardrobe. The one- and two-bedroom apartments have an open fireplace, which creates a cosy atmosphere in the living room. Wine & dine: The main restaurant is designed in warm colors and welcomes all guests for a sumptuous breakfast and dinner buffet. Daily variety of fresh salads and delicious dishes of national and European cuisine. The elegant a la cart restaurant enchants all visitors with a pleasant atmosphere bearing freshness throughout the day with exquisite dishes of traditional and European cuisine. Spa and wellness: SPA&Wellness center is designed to create peaceful and relaxing atmosphere with direct contact with the nature for all our guests. The SPA center offers indoor swimming pool, Finnish sauna, aroma sauna, steam bath, tepidaruim, Ice zone, fresh bar, massage rooms for classic and wet massages and variety of spa procedures.